GPI antibody was raised against full length human recombinant protein of human GPI(NP_000166) produced in HEK293T cell. Full length human recombinant protein of human GPI(NP_000166) produced in HEK293T cell. Due to the highly specific nature of antibodies and antigens, we cannot predict or be held responsible with respect to how this antibody will behave in your systems. Researchers using this antibody should conduct optimization studies to achieve the most optimal result possible for their intended application. Formalin fixation and embedding in paraffin wax. Make 4-um sections and place on pre-cleaned and charged microscope slides. Heat in a tissue-dryingoven for 45 minutes at 60°C. During shipment,small volumes of product will ocassionally become entrapped in the seal of the product vial. We recommend briefly centrifuging the vial to dislodge any liquid in the container's cap prior to opening. This reagent may contain sodium azide. The chemical, physical, and toxicologial properties of this material have not been thoughly investigated.Standard Laboratory Practices should be followed. Avoid skin and eye contact,inhalation, and ingestion. Sodium azide forms hydrazoic acid under acidic conditions and may react with lead or copper plubing to form highly explosive metal azides. On disposal, flush with large volumes of water to prevent accumulation. Small volumes of anti-GPI antibody vial(s) may occasionally become entrapped in the seal of the product vial during shipment and storage. If necessary, briefly centrifuge the vial on a tabletop centrifuge to dislodge any liquid in the container`s cap. Certain products may require to ship with dry ice and additional dry ice fee may apply. GPI Antibody, AMF Antibody, Autocrine motility factor Antibody, Glucose phosphate isomerase Antibody, Hexose monophosphate isomerase Antibody, Hexosephosphate isomerase Antibody, Neuroleukin Antibody, Oxoisomerase Antibody, Phosphoglucose isomerase Antibody, Phosphohexomutase Antibody, Phosphohexose isomerase Antibody, SA36 Antibody, PGI Antibody, SA-36 Antibody, Glucose-6-phosphate isomerase Antibody, GNPI Antibody, PHI Antibody, Phosphosaccharomutase Antibody, Sperm antigen 36 Antibody, Sperm antigen-36 Antibody Description: GPI is a member of the glucose phosphate isomerase protein family. The encoded protein has been identified as a moonlighting protein based on its ability to perform mechanistically distinct functions. In the cytoplasm, the gene product functions as a glycolytic enzyme (glucose-6-phosphate isomerase) that interconverts glucose-6-phophsate and fructose-6-phosphate. 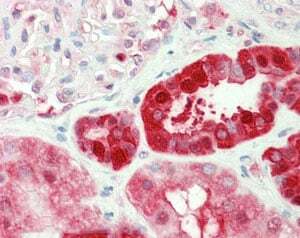 Anti-GPI antibody IHC staining of human kidney. Immunohistochemistry of formalin-fixed, paraffin-embedded tissue after heat-induced antigen retrieval. Antibody concentration 10 ug/ml. 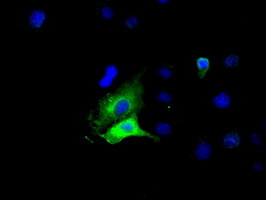 Anti-GPI mouse monoclonal antibody immunofluorescent staining of COS7 cells transiently transfected by pCMV6-ENTRY GPI. HEK293T cells were transfected with the pCMV6-ENTRY control (Left lane) or pCMV6-ENTRY GPI (Right lane) cDNA for 48 hrs and lysed. Equivalent amounts of cell lysates (5 ug per lane) were separated by SDS-PAGE and immunoblotted with anti-GPI. NCBI/Uniprot data below describe general gene information for GPI. It may not necessarily be applicable to this product. G6PI: belongs to the GPI family whose members encode multifunctional phosphoglucose isomerase proteins involved in energy pathways. A dimeric enzyme that catalyzes the reversible isomerization of glucose-6-phosphate and fructose-6-phosphate. Functions in different capacities inside and outside the cell. In the cytoplasm, the gene product is involved in glycolysis and gluconeogenesis, while outside the cell it functions as a neurotrophic factor for spinal and sensory neurons. Defects in this gene are the cause of nonspherocytic hemolytic anemia and a severe enzyme deficiency can be associated with hydrops fetalis, immediate neonatal death and neurological impairment. 1. High GPI expression is associated with metastatic phenotype of breast cancer.